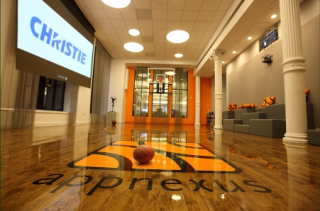 Christie and USIS AudioVisual Systems achieved success at AppNexus in creating additional space on a floor that includes both open plan office space and a basketball court. According to Todd Hutchins (CTS-D), chief technology officer, USIS AudioVisual Systems, AppNexus needed additional Razzle space. The answer was to equip the second floor - where the basketball court is located - with technology on par with the fourth floor Razzle space where three Christie DS+6K-M projectors are located, ultimately creating an extension of the fourth floor. This included the installation of one Christie HD10K-M projector- and the ability to do high-end video collaboration. When it came time to make a decision on the projector requirements, USIS AudioVisual Systems turned to Christie to fulfill its projection needs.